but the pterosaur expert referees insisted that you can’t recover juveniles by phylogenetic analysis. In their thinking they invoked the false paradigm of allometry during ontogeny, as widely observed in other tetrapods. This scientific blunder can be fixed to Bennett 1995, with regard to Rhamphorhynchus. 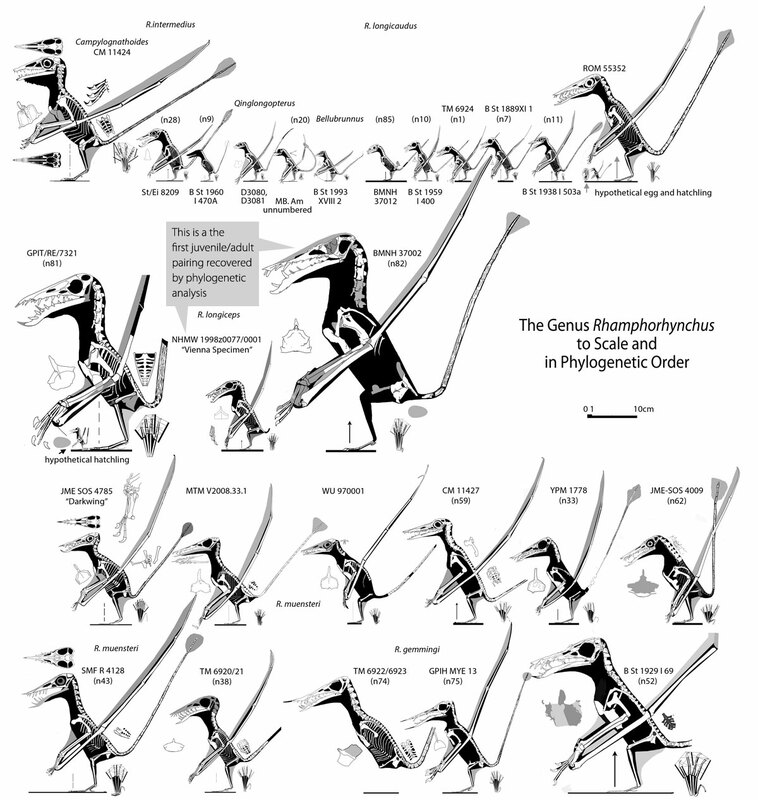 He determined that all Rhamphorhynchus (Fig. 4) were conspecific and all morphological differences could be attributed to ontogeny (the growth series during maturity). Seeing 25 Rhamphorhynchus specimens side-by-side, many the same size as others (Fig. 4), you’ll be able to judge for yourself whether they are the same or distinct. Remember you can click the image to enlarge it. Pterosaurs are different from most other tetrapods in their growth cycle. All known examples of juvenile and embryo pterosaurs associated with adults document just the opposite: immature pterosaurs are virtual copies of adults and thus they develop by isometry during ontogeny. Zhejiangopterus (Fig. 1) is the poster child for this key fact that pterosaur experts referees refuse to accept or acknowledge. Other isometric juvenile examples include Tapejara, Pterodaustro, Pteranodon, and Ikrandraco. Because juveniles and embryos are virtually identical to adults (except for crest growth), it doesn’t matter if you include immature pterosaurs in phylogenetic analysis. This is verified by the nesting of the embryo Pterodaustro with its adult counterpart, apart from other tiny pre-ctenochasmatids that nest between larger dorygnathids and larger ctenochasmatids. Figure 1. Click to enlarge. There are several specimens of Zhejiangopterus. Also shown is a hypothetical hatchling, 1/8 the size of the largest specimen. all you have to do is find a smaller version identical to a larger version and you have a juvenile/adult pairing. I was surprised to find such a pairing in a mid-sized Rhamphorhynchus NHMW 1998z00077/0001 (Figs. 2-4) and its 3x larger counterpart, a Rhamphorhynchus longiceps BMNH 37002 (Figs. 2-4, Smith-Woodward 1902). These two specimens had identical phylogenetic scores despite their disparate sizes. Not even the embryo Pterodaustro and its adult counterpart could match these matching scores. Figure 2. 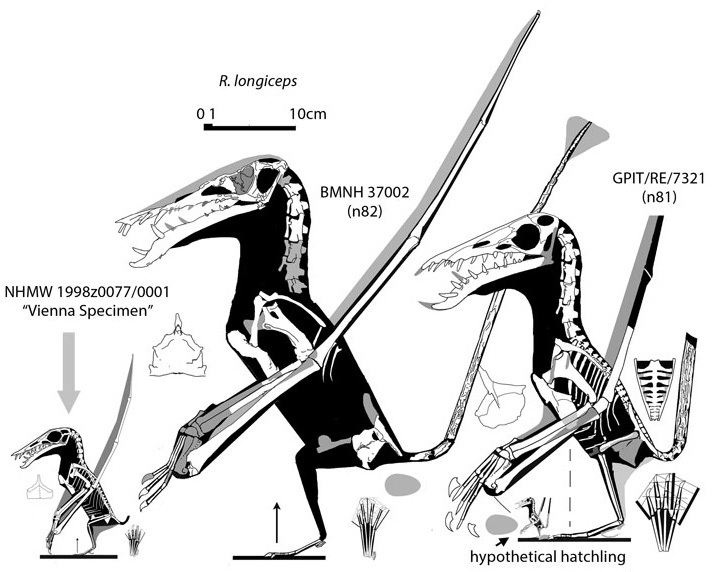 Two specimens (BMNH 37002 and GPIT/RE/7321) attributed to Rhamphorhynchus longiceps along with a third specimen (NHMW 1998v/007/0001) that nested with the larger of the two (Rhamphorhynchus longiceps BMNH 37002) with identical scores, thus identifying it as a juvenile R. longiceps. Click to enlarge. Note the size of the hypothetical hatchling in the lower right, 1/8 the size of the adult. 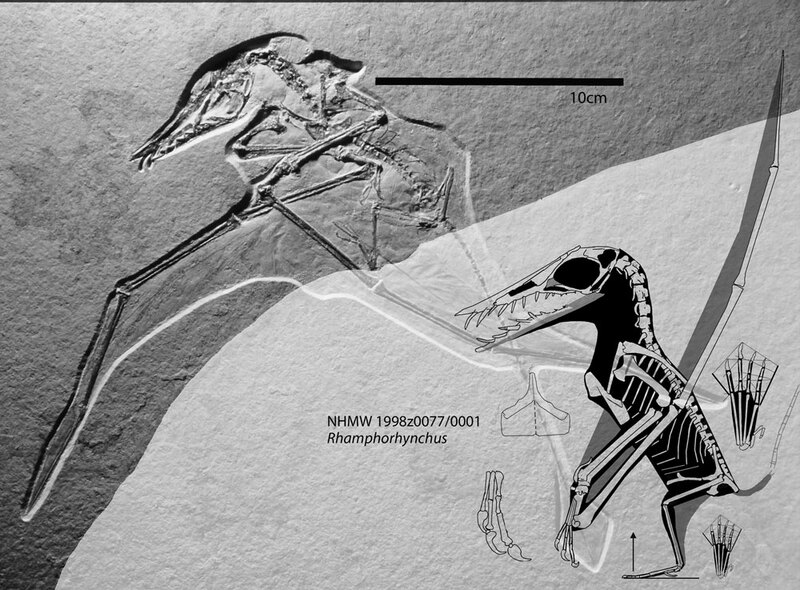 Here’s the juvenile Rhamphorhynchus longiceps, aka the Vienna specimen (NHMW 1998z0077/0001) is shown in situ (Fig. 3) and reconstructed. Figure 3. A juvenile Rhamphorhynchus longiceps fossil and reconstruction. The Vienna specimen, NHMW 1998z0077/0001. I included 25 Rhamphorhynchus specimens (Fig. 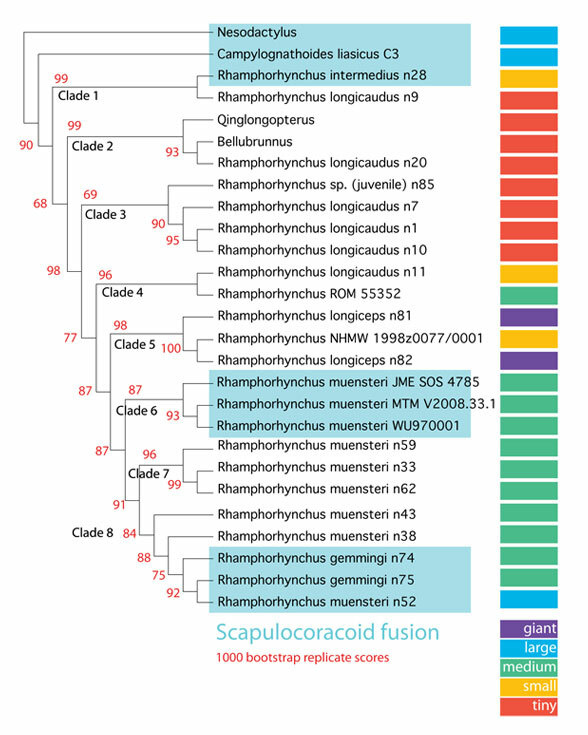 4) in phylogenetic analysis, about a quarter of those listed by Wellnhofer 1975. Many more have been discovered since then (Fig. 4). Only two, the juvenile and adult pairing, had matching scores. In the modern world, these 25 could represent 25 species! Here they divided into eight clades (Fig. 5). Figure 4. Bennett 1975 determined that all these Rhamphorhynchus specimens were conspecific and that all differences could be attributed to ontogeny, otherwise known as growth to maturity and old age. Thus only the two largest specimens were adults. Hah! Do you agree? Click to enlarge. followed the outgroup taxon, Campylognathoides (Fig. 4) as basal forms stepwise became smaller and stayed smaller for awhile. These are also among the oldest Rhamphorhynchus specimens. In the middle of the tree the giants nested. More derived Rhamphorhynchus specimens were mid-sized, but the last specimen in the series was relatively large. Figure 5. Rhamphorhynchus family tree. Blue boxes include taxa with fused scapulocoracoids. Colors on the right are coded according to size (see lower right for key). Red numbers are bootstrap scores. Eight clades are recovered here. when you add taxa and let the results speak for themselves (Fig. 5). No one else has ever tested more than two Rhamphorhychus specimens in phylogenetic analysis. Note the score for the juvenile/adult pairing is 100, unmatched elsewhere in this cladogram. 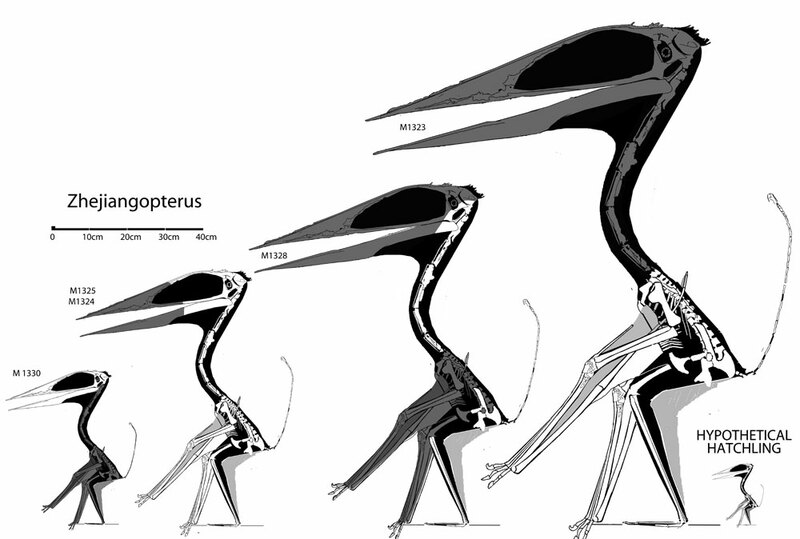 that the first juvenile recovered by phylogenetic analysis would be a mid-sized specimen, the same size of many other more common adult Rhamphorhynchus species (Fig. 4). The juvenile was mid-sized because it was a juvenile of a giant Rhamphorhynchus species. It was big enough to fly and fossilize with the grown-ups. juveniles pterosaurs are rare in the fossil record. Juveniles of all sizes of pterosaurs must have lived in non-fossiliferous environs. I wrote, “Compared to BMNH 37002, the Vienna specimen had a slightly shorter rostrum and sternal complex, but not short enough to affect its score. So, if it was indeed a juvenile of the larger BMNH 37002, then these minor differences reflect a certain amount of allometry. It is also possible that the Vienna specimen was a juvenile to a shorter-snouted, undiscovered adult. The third possibility, that the Vienna specimen was a smaller adult sister taxon that ultimately gave rise to the giant BMNH 37002 also remains a possibility. However, many examples of other closely related Rhamphorhynchus specimens that do not have identical character scores weighs against that idea. Despite their great size, none of these [giant] clade members had a fused scapulocoracoid. just as there were in the Pterodaustro juvenile/adult pairing, but not enough to change scores. As you can see, I looked at each specimen very carefully and without prior bias. The juvenile status of the Vienna specimen came as a complete surprise, the delight of discovery. If anyone wants to read the unpublished manuscript in PDF form, just send me an email. Luckily 4x rejected manuscripts can have a second life on the web. given the facts, if pterosaur juveniles were virtual copies of adults. If anyone has a pair of specimens that falsify this hypothesis, please send me the museum numbers! to realize that up to eight pterosaur referees (some may have refereed the manuscript more than once just to keep it out of circulation) clung to their outmoded beliefs in the face of hard facts that should have changed their paradigm. They didn’t want this data to get out, so they suppressed it. I’ll pull a few quotes from the rejection letters so you can see how their status quo beliefs trump reproducible tests and observations. If you thought we had outgrown such behavior in 2015, you’re in for a shock. Bennett SC 1995. A statistical study of Rhamphorhynchus from the Solnhofen Limestone of Germany: Year-classes of a single large species. Journal of Paleontology 69: 569–580. Smith-Woodward A 1902. On two skulls of the Ornithosaurian Rhamphorhynchus. Annals and Magazine of Natural History, London, (7) 9: 1-5. Wellnhofer P 1975a-c. Teil I. Die Rhamphorhynchoidea (Pterosauria) der Oberjura-Plattenkalke Süddeutschlands. Allgemeine Skelettmorphologie. Paleontographica A 148: 1-33. Teil II. Systematische Beschreibung. Paleontographica A 148: 132-186. Teil III. Paläokolgie und Stammesgeschichte. Palaeontographica 149: 1-30. This entry was posted in academic publication, pterosaurs, reptile family tree, Rhamphorhynchus and tagged pterosaurs, Rhamphorhynchus by davidpeters1954. Bookmark the permalink. I would greatly appreciate the opportunity of reading your four as yet unpublished manuscripts. Although I have no formal qualifications I think that science is for all. I’d love to read these manuscripts as well! The gist of the unpublished manuscripts and figures appears in various blog posts and at ReptileEvolution.com. Thank you for your interest, Ashley.